Welcome to the 2nd annual Naughty or Nice Christmas Card Exchange!! CEWTNK(Close Encounters with the Night Kind) has joined with RBTL(Read Between the Lines) to bring you this fun and inexpensive way to connect to new bloggers and discover new authors! Are you not a blogger or author but want to participate? No problem!! You can join in the fun too! But we do have some rules! 1. Addresses that are submitted and exchanged are to be used for this event ONLY! We want this to be fun event and DO NOT want to worry about someone using our addresses for nefarious purposes!! And yes SPAM is not allowed!! 2. You may send Business cards, bookmarks, swag, or other items with the card as long as it is book, blogger, or Christmas related. 3. If for any reason you can not send out your cards, notify us. We want to make sure everyone participating gets a card. 4. The most Important Rule: HAVE FUN!! 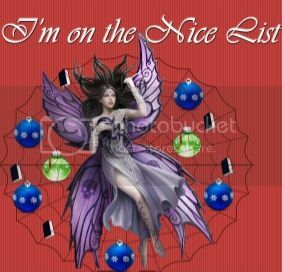 Even if you are on the NICE list...try...LOL!!!! The sign-up sheet is below! Entries will be accepted until November 25. Everyone will receive their card addresses by December 1. If you have any questions please email Nikki: viajeradelmar@aol.com or Anna: sadase98@gmail.com. Please grab the badge, place it in your sidebar, and link to this post. Help us get the word out!! Hey Nikki! The banner doesn't fit in my sidebar, but I put a link to it at the top of my posts - http://digiscrapping.net/blog/2013/08/14/unscrupulous-by-avery-aster-blitz-tour-wide-giveaway/ - it'll be like that on every post.